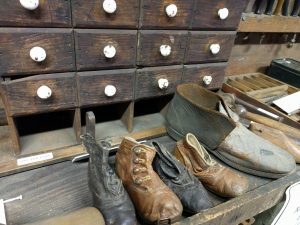 The Historical Society of Haddonfield has been awarded a $1,836 matching grant from the Conservation Center for Art and Historic Artifacts (CCAHA) for collections care. The award is funded with the generous support of the William Penn Foundation, and will allow the Historical Society to purchase computer hardware and software, a dehumidifier, UV light filters, and supplies for monitoring insects, labeling artifacts, rehousing archival collections, and responding to emergencies. The Historical Society qualified for the grant by participating in CCAHA’s Philadelphia Stewardship Program. Over the last two years, the Historical Society has been awarded $15,758 in CCAHA services and matching grants through the program, which aims to help nonprofit collecting institutions achieve their preservation and conservation goals. As 2016 comes to a close, please consider making a special year-end gift to the Historical Society of Haddonfield. Thanks to your past support, the past year has been an exciting time around here. 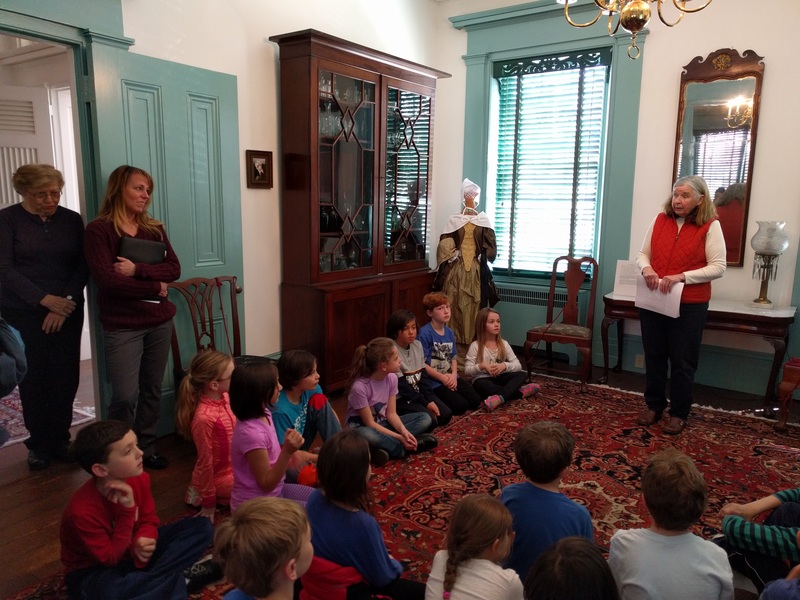 We’ve expanded our work with local students and educators, created new tours for second graders, published a book about Samuel Nicholson Rhoads co-authored by Haddonfield Middle School students, and continue to mentor high school students working with primary sources in our Archives Center. And we continue to reach new audiences with our public programs, our book club, and our website. But we also have important responsibilities as the stewards of historic Greenfield Hall and the Samuel Mickle House, the oldest frame structure in Camden County. Would you consider making a special gift to help us complete some important maintenance and restoration work in Greenfield Hall this year? Your donation will help us tackle projects from the roof to the basement, helping to ensure that Greenfield Hall is here for generations to come. We are a 501(c)(3) organization, so your gift will be tax deductible to the full extent of the law. 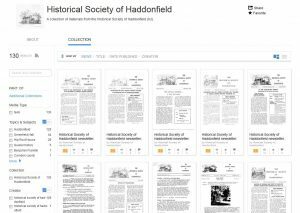 You can donate today by clicking on the yellow “donate” button in the right column of this page, or by mailing a check to Historical Society of Haddonfield, 343 Kings Highway East, Haddonfield, NJ 08033. Thank you in advance, and happy new year! The Historical Society will be closed between December 24 and January 1, and will reopen on Monday January 2. Due to the holiday, we will also be closed for our usual “first Sunday” hours on January 1. But as always, feel free to contact us to schedule an appointment to visit at another time. You can browse images of the pages, search full-text versions of the articles, or follow subject tags to find other related content. Happy reading! Celebrate the history of Haddonfield! On Giving Tuesday, help us protect Haddonfield’s rich history for generations to come. Your donation will help us continue to share our area’s history with local students, preserve important artifacts and family papers, and care for Greenfield Hall and the Samuel Mickle House. 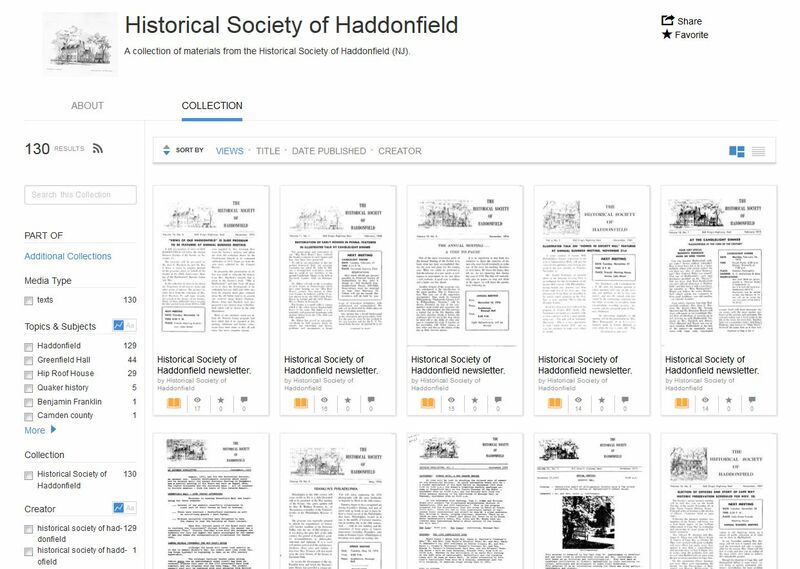 You can make a gift online using the PayPal link on the right side of this page, or mail a check to the Historical Society of Haddonfield, 343 Kings Kingway East, Haddonfield, NJ 08033. Thank you in advance for your support! We’re so appreciative of all of our members, donors, volunteers, and others in the Haddonfield community who have backed us over the years.